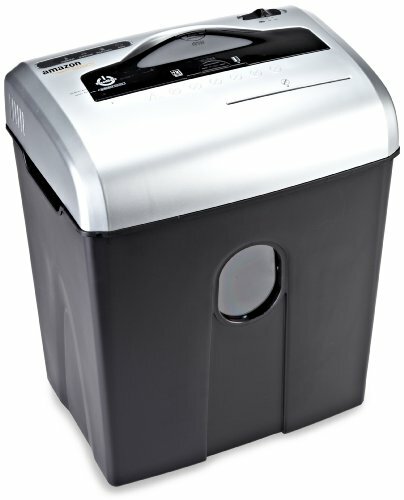 This AmazonBasics 12 sheet cross cut shredder has a capacity of 12 sheets of paper at a time. It can easily destroy multi-page documents with staples or paper clips on them without having to remove them. It can also destroy credit cards, CDs, and DVDs one at a time. It has a continuous run time of 5 minutes and a cool down time of 30 minutes. It has a regular bin type with a capacity of 3.8 gallons. This AmazonBasics product is covered with the industry standard 1 year limited warranty. This model follows the typical cross-cut technology. It has a DIN P-3 security level as it has a surface area of less than or equal to 320 square mm. Some user reviews claim that aside from having dedicated slots that enable the shredder to destroy credit cards, CDs, and DVDs, it can also easily chomp down on other items. These other items referred to include cardboard, cereal boxes, glassine envelopes, unopened junk mail, newspapers, and stickers. Unfortunately, these claims are not something the model’s manufacturer would recommend. Doing so would only cause premature wear and tear, cause jams, and break internal parts. What it was designed for is to cut down 12 sheets of 20-pound weight regular bond paper at a time. This model’s throat size is 8.7 inches long and ¼ inches deep, adequate for the usual paper widths of 8.5 inches. If you’re going to shred papers of wider size, simply fold the paper in two. Take note that folding the paper equals a count of two sheets so you’ll have to decrease the number of sheets to feed at a time. You’ll find the paper slot for the machine behind the safety flap across the middle of the shredding head. You’ll have to push the cover to reveal the paper slot. Unlike other models, papers would have to slide the same angle as the flap to feed the shredder. Some users find this a better alternative to the usual way of dropping the papers vertically. In cases of paper jamming, the machine will automatically stop and trigger a warning light. When this happens, you need to simply empty the waste basket before clearing the jam via manual reverse. If this simple trick doesn’t work, you can check the machine’s manual for instructions on how to resolve this kind of scenario. It will teach you how to soak jammed paper with shredder oil or how to use a cardstock sheet. You can also prevent paper jams by emptying the waste basket promptly. Do not wait for it to become full as too much waste paper in the basket can cause the shredded papers to feed back into in the cutting blades, causing a jam. There are three major safety features in this model. These are Safety Cover, ShredSafe, and Safety Interlock. Safety Cover shields the paper feed slot when the shredder is at rest. This prevents accidents from happening. Accidentally dropped items will no longer be necessarily cut into pieces. Parents and pet owners will also have the peace of mind and security knowing that they no longer have to worry about curious fingers sticking into the blades or paws and tails getting cut into pieces. In addition to this, the Safety Cover also acts as a safety switch before you can shred anything. You will need to tilt the flap open first before you can get any shredding done. Another purpose for the Safety Cover is to ensure covered shredding for instances when you might be pushing large and stiff documents through the shredder, exposing the cutting parts completely. The potential jam and accidents are set to trigger Safety Cover. Meanwhile, the most featured of these three safety features is ShredSafe. This safety measure prevents forced entry into the paper slot. This can prevent major injuries from happening when curious children keep poking through the machine and surpass the Safety Cover. The last of the safety measures, the Safety Interlock, is also meant to prevent major harm from occurring should the cutting blades be completely exposed. This interlocks the top unit and the waste basket together. Separating the two triggers the machine to automatically shut down. Expect the machine to bog down when fed beyond its capacity. If you want it to work faster, you can do so by feeding an average of only 8 to 9 sheets at a time. This amount can be enough for home or personal shredder use. This model has gained general positive customer satisfaction reviews. It is packed with childproof safety measures and it is said to perform even more than its expected capacity. It is generally impressive while its cons are too few and understandable enough. This model is great for home and personal use.